We had to vacate the property this morning by ten so we made fast work of packing the car and tidying up the place. Those crane-like birds were out on the front lawn again this morning cackling. We’ve seen them a few times now and they really do seem to be very tame but also a little intimidating with their very loud croaking. ￼We never feed wildlife and so they soon gave up and moved on. To prevent any possible ‘misunderstanding’, I took photos of the house after we’d removed all our stuff and put things back the way we found them. I did this just as a precaution to stave off any potential problems with the owner claiming we’d broken anything or that we’d left the place in a mess. You never know. Even with the kids running around at our feet and Jennifer in particular being a bit on the moody side this morning, we managed to get away well before the deadline and made our way one last time to the Golden Coral on 192 for the breakfast buffet. To be completely honest, I could do without the Golden Coral now for a while. You can have too much of a good thing. We already knew that the weather was likely not going to play along today and the somewhat overcast skies foretold of rain ahead for the day so we were a little stumped as to what, if anything, we could do for the day. The plan was to kill some time whilst still here in Orlando before stopping off for the night at Patti’s house in Palm Coast, which is on the way back to Jacksonville. ￼We decided in the end to take the kids to a place called Wonder Works on I-Drive. We’ve been there before and we thought it might keep the kids occupied for a few hours, as they have lots of hands-on exhibits there. In the event, we only managed an hour and a half at Wonder Works. To be honest, it was a bit of a disappointment and not really worth the $40 we paid to get us all through the door. In actual fact, it would more than likely have been cheaper for us to go back to a major theme park and pay the $12 to park. 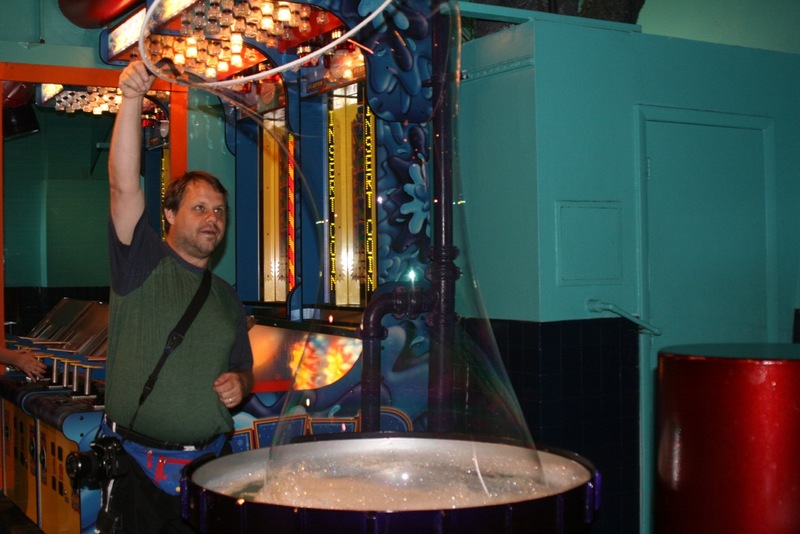 The funny thing is that everything at Wonder Works is exactly how we remembered it some years ago before we had kids. It was a bit of a disappointment then too but I guess we’d forgotten about that. As we drove back onto I-Drive, we toyed briefly with the idea of stopping in at Universal again, since we were so close, but we decided that the long walk into the park would bring with it too much risk of getting soaked in a sudden downpour so we set off up I-4 towards the East coast and then North in the direction of Jacksonville. We only got a short distance past downtown Orlando before hitting a traffic jam that was the result of a major road traffic accident that must have only recently happened. Shortly thereafter, we had to slow right down again to accommodate a torrential downpour - the sort that made us glad we didn’t go into any of the theme parks again after all today. As we reached the Palm Coast area, we were still too early to catch Patti home from work so we stopped off at a recently new built shopping centre not far from Patti’s house to do a bit of window-shopping at Target & Books A Million. Naturally, we came away with a few carrier bags stuffed with bits and bobs. When we reached Patti’s house, Ben & Joseph were already there and we quickly made ourselves at home. Patti herself was very late getting home on account of slipping whilst shopping this evening and pulling a muscle in her leg. I may very well end up driving her to the doctor tomorrow morning. We ate a lovely home-cooked meal and had plenty of fun showing off some photos and the new camera to a keen audience through the evening before getting the kids settled and finally off to bed ourselves.